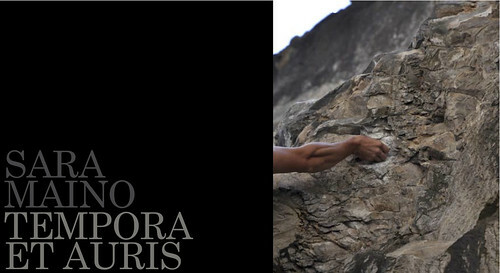 On the occasion of the 2011 Free-Climbing Festival, the video installation “tempora et auris” by Sara Maino (Arco, 1970) is inspired by the stratification of acoustic memories, expressed by the symbolic places of Bosco Caproni in Arco: the cliff face, dedicated to climbing, of the former oolitic limestone quarries, used for extraction of the stone from the mid-19th century up to the second half of the 20th century. 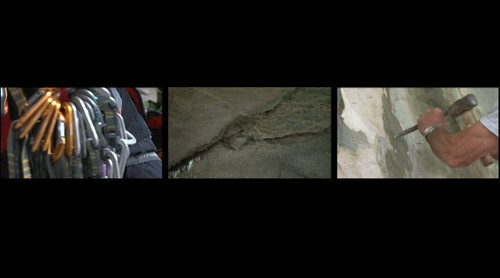 The sounds that may be heard in the installation identify three eras: the time when the place was an ancient seabed; the modern age, in which the place was exploited for quarrying stone; and the contemporary age, in which the sound of miners’ pickaxes has been replaced by that of the tools of climbers, who use the space as a rocky training ground. nell’installazione contraddistinguono tre epoche: il tempo in cui quel luogo era il fondale di un antico mare; l’epoca moderna, in cui il luogo era sfruttato per l’estrazione della pietra; l’epoca attuale, in cui al suono degli scalpellini è stato sostituito il suono degli attrezzi degli arrampicatori che lo usano come palestra di roccia.